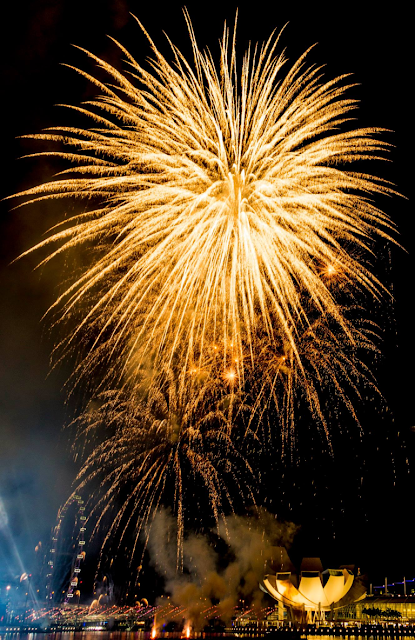 i could be going to Germany MPTL20 in 2015? The International Conference on Multimedia in Physics Teaching and Learning provides an annual forum to exchange information and ideas about the use of multimedia in physics teaching and learning. The scientific advisory board includes members of the Open Source Physics group like Wolfgang Christian, Davidson College, USA and Francisco Esquembre, University of Murcia, Spain for which the SS has deep expertise on. As such, the objectives of training include: 1) gain the latest ideas and knowledge on incorporating ICT in education; 2) share these ideas and knowledge with colleagues and teachers upon return; 3) explore possibilities in integrating new ideas and knowledge into local educational context, 4) contribute new ideas to the international educational community of the conference by presenting a paper Open Source Physics. Given the multiple opportunities to learn and contribute new ideas to the international educational community from the conference, it is beneficial and worthwhile for the nominated specialist to participate in the MPTL20. Nominated officer’s present duties include use of the Open source Physics tool, Tracker for advancing eduLab 017: becoming like scientist through video analysis. The participation in this proposed conference will benefit the officer’s immediate job scope, the Singapore leaning communities and committee the officer sit in such as the H1 and H2 A level syllabus development. The officer can also add new perspectives to the global arena with the work based on the Singapore context. Besides, the latest findings and issues discussed in this conference will help assist in the mentoring of our collaborating teachers in integrating ICT in the classroom, so as to guide them towards the goals of mp4. I have been developing stand alone EJS and more recently EjsS computer models to allow anyone to run them on their Android tablets and iPad. 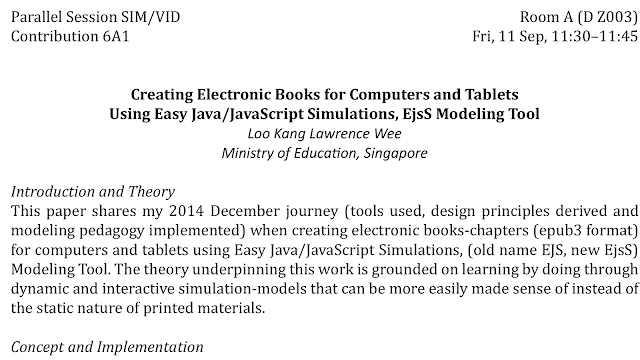 After the Singapore Easy Java/JavaS-cript Simulations, EjsS Modeling Tool workshop organised by Francisco Esquembre and Wolfgang Christian 25-28 November 2014, I started combining related computer models with supporting texts and illustrations into a coherent chapter, a logical next step towards tighter support for teachers and students. I have since spent 6 months developing prototypes electronic chapters on the topics of Sim-ple Harmonic Motion and Gravity customized for the Singapore-Cambridge General Certifi-cate of Education Advanced Level (A-level). I aim to inspire more educators to create interactive and open educational resources for the benefit of all and network with like minded educators to add elements of assessment for learning, such as automated marking in future releases of the electronic books-chapters. and Apple iBook Store Google Play Book and Kindle Book. of instead of the static nature of printed materials. cate of Education Advanced Level (A-level). learning, such as automated marking in future releases of the electronic books-chapters. has been accepted for the 20th Internationa Conference on Multimedia in Physics Teaching and Learning. Attached you will find the reviewer's comments. We would like to encourage you to improve your abstract based on the reviewer’s comments. We added Word documents to the EasyChair system for most of the submissions. Please download these Word documents (if available) and edit them according to the reviewer’s comments (otherwise please use the word template on the conference website). Afterwards, please use the update function to upload the edited file. Please do not open a new submission. Although dividing the abstract into three parts according to the author guidelines was only a recommendation, most of the authors followed this recommendation. Thus, we would like to encourage those who have not done so yet to structure your abstract in the same manner. And please take a look at the author’s names and affiliations. Please keep in mind that the Book of Abstracts will be published by the European Physical Society in printed and in electronic form with ISBN. The topic is of great interest because it points to the immediate future of science textbook publishing. Although technical aspects are important, I would be particularly interested in learning about the design and pedagogical aspects of this work. What implications has the new media in the way the author writes the narrative and interacts with the embedded simulations? The author mentions these aspects and I hope he insists on them in his presentation. Creating and distributing interactive ePub 3 books is technically challenging and MPTL participants will be interested in learning about the author's experience developing the proof-of-concept eBooks referenced in the abstract. 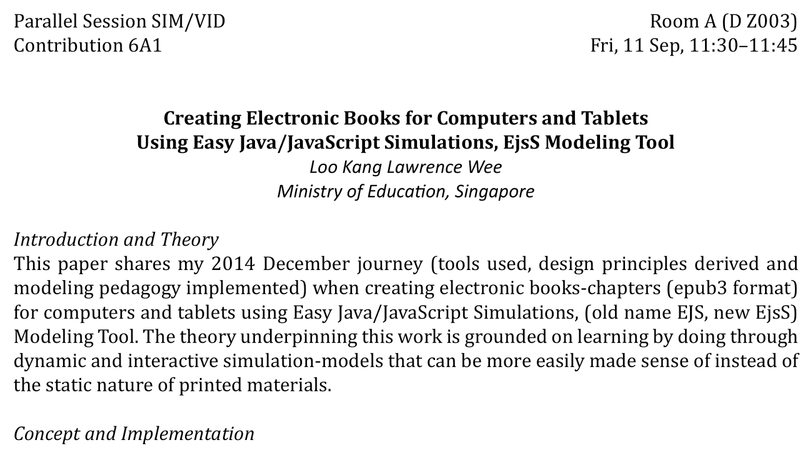 As stated in the abstract, the author has created many interactive simulations for use in Singapore schools and the materials in the author's eBooks are also available on his website in standalone html pages. It would be useful to learn if eBooks distribution is successful and if this new distribution mechanism is being compared to other distribution mechanisms and if the eBooks are being improved based on teacher feedback. I have since spent 6 months developing prototypes electronic chapters on the topics of Simple Harmonic Motion and Gravity customized for the Singapore-Cambridge General Certificate of Education Advanced Level (A-level). I hope to inspire more educators to create interactive and open educational resources for the benefit of all and network with like minded educators possibly adding elements of assessment for learning, such as automated marking in future releases of the electronic books-chapters. to be held in Munich, Germany, 9-11 September 2015. The Ludwigs-Maximilians-Universität München is proud to organize the MPTL 2015, and we will do our best to make it both fruitful and enjoyable. 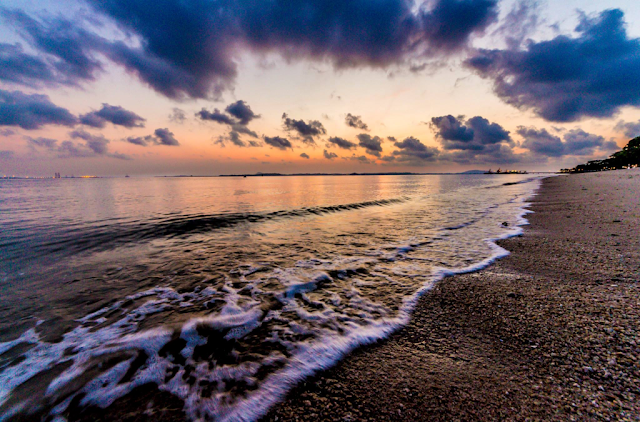 The MPTL 2015 will be an opportunity not only to present the results of your work, but also to communicate and discuss common research topics with colleagues. Please consider submission for the conference. The first 50 international researchers (with PhD) with accepted contributions will receive a 150 Euro travel grant! The registration page is now open. When submitting an oral presentation, a poster, a workshop or a symposium proposal, you will be required to submit an abstract not exceeding 3000 characters (incl. spaces and special characters) via the registration site on the conference web page. The official language of the conference is English, so proposals should be sent and presented in this language.